← Ready for Strategic Planning? 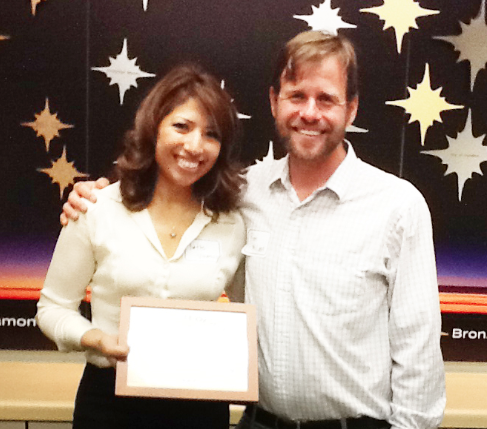 In the picture above with me is Ivette Vivanco, the young leader I coached as part of this leadership program. Ivette is passionate about issues related to hunger and homelessness in Los Angeles. Together, we discussed various topics relating to her work to launch a new nonprofit called the Los Angeles Partnership to End Hunger and Homelessness. I recently attended the graduation of the first class of Millennium Leadership fellows and was moved by how much the process added value to their lives. All of them spoke eloquently about how much they grew during the program. I’m hopeful that funders in the philanthropic community will recognize the value of this program and support it, which will give other young leaders the opportunity to build their own capacity to serve. This entry was posted in Coaching, Leadership Development, My Clients and tagged Clients, Coaching. Bookmark the permalink.